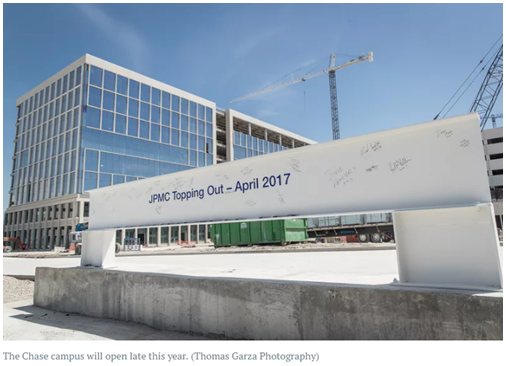 ​​PLANO – Construction crews topped out the buildings for JPMorgan Chase's new 1 million-sf campus. The 50-acre project is developing on the south side of SH 121 just west of the Dallas North Tollway. Construction on Chase's buildings—which will house almost 6,000 people—is scheduled to be completed late 2017. The project includes training and conference space, a food court, dining area and coffee shop, health and wellness center and childcare facility. Chase will be consolidating workers now located in Farmers Branch, Dallas and Lewisville into the new project. Chase joins Toyota, FedEx Office and Liberty Mutual Insurance as anchor business residents in Legacy West​. ​Want more da​ta? See DFW Office Market Research.